If you’ve been looking to upgrade your bedroom with the addition of a platform bed, you may be wondering which style is best for you. Here, we’ve collated our top picks for the best platform beds that provide a comfortable surface for your mattress and look great, too. We chose the Zinus Upholstered Platform Bed because of its outstanding reviews for comfort, sturdiness, and high-quality design. If you are looking for a statement platform bed that not only looks great but provides the perfect base for your mattress, you can’t go wrong with this choice. Our top pick for the best platform bed is the Zinus Upholstered Button-Tufted Premium Platform Bed, which exudes quality, style, and is a bed frame built to last. Our runner-up is the innovative Floyd Platform Bed, a minimalist solid platform bed that is easy to install with zero tools required, and which keeps your bed supported without taking up any more space than necessary. Platform beds have risen in popularity in recent years, replacing the traditional box spring bed with a more contemporary, versatile look. Available in a wide range of styles, materials, and designs, platform beds provide the opportunity to add a real statement to your bedroom. With a choice between low-profile platform beds and those with under-bed storage, solid bases and those with slats, not to mention frames with wood, metal, or both – there are a lot of decisions to be made! A platform bed is a simple bed frame that does not require a traditional box spring. Instead, it acts as a built-in foundation for a mattress, providing enough support for you to place the mattress directly on the frame. Platform beds can have either a solid surface or a slatted support system made of wood or metal, designed to provide a more breathable surface for your mattress to lie on. With so many different designs and styles of platform beds available these days, it can be difficult to know what type is best for your needs. One of the first things you need to decide is if you need a platform bed with a solid or slatted base. Below, we’ve covered the pros and cons of each option. Next, you’ll find our top five picks for the best platform bed on the market. Solid Vs Slats: Which Is Best? The two most common styles of platform beds are those with a solid base and those with slats. Both options have their pros and cons, so we’ve covered the main points below to help you decide which is best for your needs. A solid platform bed has a solid, flat surface upon which your mattress can be placed. In some cases, the flat surface will extend beyond your mattress for a contemporary look, providing an additional surface to act as seating or as a nightstand around your mattress. Solid platform beds do not require a box spring and often come with the added bonus of pull out storage underneath. The main drawback, however, is that a solid base does not provide much airflow for the mattress, which can increase the risk of your mattress developing mould and mildew over time. A platform bed with slats, unlike a solid platform bed, offers plenty of airflow to the mattress via evenly spaced slats that run across the width of your mattress. These slats provide a slightly flexible surface for your mattress and are designed for use without a box spring. The added airflow slatted platform beds provide is a huge bonus to this style, but users should note that slats spaced too far apart can cause memory foam and latex mattresses to sink and the slats may also not be ideal for heavier people. 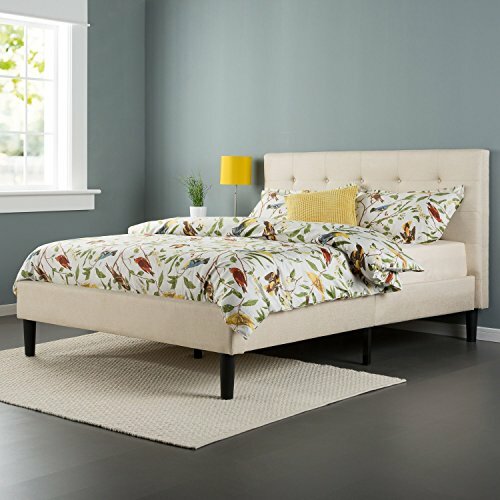 The Zinus Upholstered Button-Tufted Platform Bed is a premium bed frame that has excellent reviews for its easy assembly, gorgeous aesthetic, and sturdy design. Designed for use without a box spring, this high-quality platform bed can likely be used with your current mattress to give a contemporary upgrade to your bedroom. You want a slatted platform bed: Slatted platform beds provide a more flexible surface to soften the feel of your mattress and are great at increasing airflow – which is great for memory foam mattresses, due to their tendency to overheat without sufficient ventilation. You want a headboard with your bed frame: This platform bed includes a headboard fixed to the frame of the bed, adding a luxurious, premium look to your bed design. If you want a simple, inconspicuous frame for your mattress, this may not be the option for you. You want a sleep trial before you commit: All Zinus mattresses and frames come with a 100-night sleep trial, allowing you to fully test the product before you commit to keeping it. The Zinus Upholstered Button-Tufted Platform Bed is a sturdy, slatted platform bed, 44.5 inches in height, including the headboard, which comes fitted to the bed frame. The bed is constructed from a steel frame covered with tufted upholstery made from knitted polyester in a stylish taupe colour. To support your mattress, wooden slats are included, with foam padded tape added to the steel frame to avoid any noise when in use. This platform bed includes single box shipping, with all parts needed for assembly included in useful zippered compartments and pockets. Designed for use without a box spring, the Upholstered Button-Tufted Platform Bed has wooden slats 3.27 inches apart on the Queen-size model, providing enough space for air to pass through your mattress and keep you cool, while still remaining close enough to avoid sinkage if you have a memory foam or latex mattress. This bed has a weight capacity of up to 500 pounds, excluding your mattress, so is ideal for most sleepers, as well as the weight of a heavier latex mattress. If you are a heavier couple with a heavy mattress, it is worth considering the combined weight of you and your mattress, before purchasing. Overall, we chose the Zinus Upholstered Platform Bed because of its outstanding reviews for comfort, sturdiness, and high-quality design. If you are looking for a statement platform bed that not only looks great but provides the perfect base for your mattress, you can’t go wrong with this choice. The Floyd Platform Bed is innovative, minimalist, and ingenious in its simplicity. Requiring no tools for assembly, this platform bed is built to last and provides the perfect low-profile platform bed for smaller spaces. You want a solid platform bed: A solid platform bed base provides a firm feel with plenty of support for a wide range of mattresses. If you are suffering from back pain or prefer a mattress with a firmer feel, a solid platform bed, such as the Floyd Platform Bed could be an ideal option. You want a simple, minimalist design: The Floyd Platform Bed has a simple, minimalist design, consisting of just three birch panels and steel legs that can be fitted to the panels with no tools required. If you are looking for a minimalist bed to complement your bedroom’s interior design, you can’t get much simpler than this. You have a small bedroom: If you’re working with limited space in your bedroom, the low-profile, simplistic design of the Floyd Platform Bed could be ideal. This bed frame takes up very little space other than the platform for your mattress – leaving you with plenty of space for storage and moving around comfortably in your own bedroom. The Floyd Platform Bed is constructed from just a few materials: namely, real birch and steel. The birch panels are constructed with a honeycomb core, which is designed to keep the panels lightweight, but still sturdy enough to provide a strong and stable base for your mattress and you and your partner while sleeping. Finished with a light clear coat, the panels are made in Virginia and CARB-2 certified, which means they meet government standards for VOC off-gassing. To support the birch panels, the Floyd Platform Bed includes US-manufactured steel supports for legs, and nylon ratchet straps to secure the panels and reduce any creaking from the bed. Overall, the bed has a total weight limit of 600 pounds, so you can rest assured that this lightweight bed frame is durable and made to last. Floyd’s main brand message is to create products that are ‘made for life, not the landfill’. The simplistic design provides a sturdy bed frame with minimal materials that are strong enough to provide a comfortable base but can also easily be packed up and transported, if needed. This platform bed comes with a 60-day return policy and a 10-year warranty. Overall, we’ve selected this solid platform bed as our runner-up because of its innovative design and simplistic design, providing a low-profile bed frame that is built to withstand the test of time. One of the main downsides to platform beds is that their weight limit cannot always support a plus-size person or heavier couple, especially with a heavy latex mattress. The Mantua Premium XL Platform Bed, however, is a heavy duty frame, designed to provide the ultimate support. With a weight capacity of 2,000 pounds per bed frame, this platform bed is our top pick for heavier sleepers. You are a plus-size sleeper: This heavy-duty platform bed frame has a weight capacity of 2,000 pounds per frame, which means the XL frame has a total combined weight capacity of 4,000 pounds for the Full XL-size frame. You want a sturdy, metal platform bed frame: If you would rather stay away from a wooden platform bed, the Mantua Premium Bed Base is a great option, consisting of only the steel frame with no embellishments. You want a platform to be with quick, easy assembly: The Mantua Premium Platform Bed Base requires no tools, for a convenient assembly process. The parts can simply be snapped and fastened into place, so you can get your frame set up and ready for use within minutes. 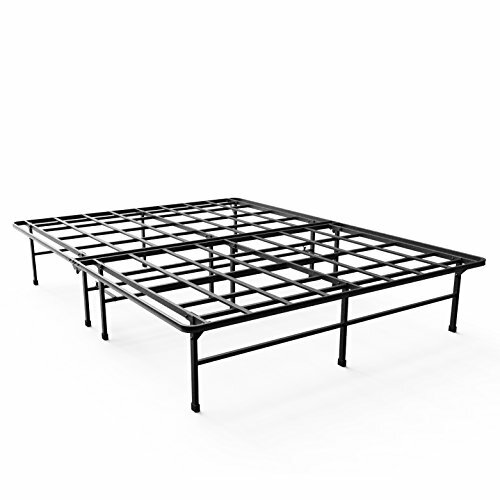 The Mantua Premium Fully XL Platform Bed Base has arguably the most simplistic construction on this list, featuring a simple steel frame that can snap together to form the XL frame. The small steel slats on the frame are spaced 5 inches apart, making it ideal for use with any memory foam or latex mattress, without the risk of it sinking between the slats. What’s more, this frame is fine for use without a box spring, but you can put a box spring on top of it, if you want to raise the profile of your bed. With a weight capacity of 2,000 pounds per frame, this is the ideal platform bed for plus-size sleepers. You can use the frame alone for a more simplistic design, or place inside an existing wooden frame (depending on the size), for additional support. The frame has a height of 14 inches, leaving plenty of room under the bed for additional storage space in your bedroom. If you have limited space inside your room, this extra storage space can be extremely helpful for storing your belongings out of sight. Overall, the Mantua Premium Fully XL Platform Bed Base is a simple platform bed, but it provides serious support where you need it. If you are a plus-size sleeper, or simply want a durable, sturdy platform bed frame that you know will withstand the test of time, the Mantua frame is a solid option that offers excellent value for money. The KD Frames Nomad 2 Plus Platform Bed is simple in construction but provides all you need for a solid platform bed on a budget. Made from unfinished eco-friendly tulip poplar hardwood sourced from the US, KD Frames uses no chemicals in their products and focuses on producing quality, long-lasting bed frames that are simple, functional, and great value for money. You want a solid wood platform bed: If an eco-friendly bed is a key priority for you, this solid wood platform bed could be a good option. Manufactured from eco-friendly tulip poplar wood sourced from “responsibly managed Virginia forests”, the Nomad 2 Plus is untreated, for a smooth surface, free from chemicals and toxic materials. You are on a budget: This platform bed is budget-friendly, especially considering its materials. If you are looking for a simple platform bed that is durable but won’t break the bank, this is a great option. You want under-bed storage: The Nomad 2 Plus has a clearance of 11.5 inches from the floor and even comes with optional storage drawers made specifically for this bed frame. If you are looking for a platform bed primarily because you want the added storage space underneath, this frame provides plenty of under-bed space. The KD Frames Nomad 2 Plus Platform Bed is simple in its construction, but that doesn’t mean it’s not a high-quality product. Constructed from tulip poplar hardwood, the frame has a minimalist design with a clean, simple finish that blends effortlessly with any decor you have in your home. The slats are flush to the top of the frame and are spaced 2.8 inches apart, which is ideal for memory foam and latex mattresses. KD Frames focuses on creating durable, long-lasting products that are sourced and manufactured in the US. The Nomad 2 has no chemical treatments, leaving the wood unfinished. This means you can either leave the wood as it is for a natural look, or you can customise it with varnish or paint to achieve your desired look. The frame has a maximum weight capacity of 600-pounds, so is sturdy enough for a heavy latex mattress without any sinking or risk of the slats flexing too much. If you do not have a memory foam or latex mattress, the company also has the Nomad 2, an even cheaper option with wider slat spacing than the Nomad 2 Plus. The bed has 11.5 inches of clearance from the floor, providing ample storage space if required. Additionally, KD Frames manufacture storage drawers designed specifically for the Nomad 2 Plus frame, so you can easily add convenient storage underneath your bed or even stow a guest bed for when you have overnight guests. Overall, this is a minimalist platform bed that has excellent reviews for its sturdiness and durability. If you’re looking for a platform bed on a budget, the Nomad 2 Plus is a high-quality bed frame that will blend beautifully into any bedroom decor. The Zinus Steel Elite SmartBase platform bed has a lot to offer: ample space underneath for storage, easy assembly, and a seriously sturdy frame for any type of mattress. If you’re looking for a quality all-rounder that provides plenty of space to store items underneath, you can’t go wrong with this contender from Zinus. You want under-bed storage space: One of the biggest pros of a platform bed over other frame styles is the ample storage space underneath. The Zinus Steel Elite SmartBase is our top pick for a platform bed with storage space, as it has an entire 13 inches of space underneath, for boxes and other items you want to keep out of sight. You want a simple, sturdy bed frame: The Steel Elite SmartBase is another simple, minimalist bed frame that won’t interfere with your bedroom’s current interior design theme. 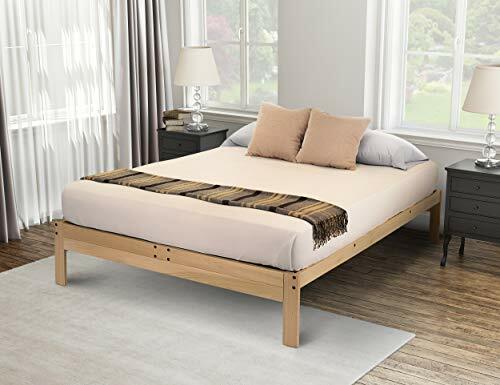 If you are looking for a sturdy frame that will provide a comfortable base for your mattress, this platform bed is a simple but effective option. You want to test your platform bed before committing to buying it: This Zinus platform bed comes with a 100-night sleep trial period, so you’ll have the opportunity to make sure this bed is right for you before committing to buying it. 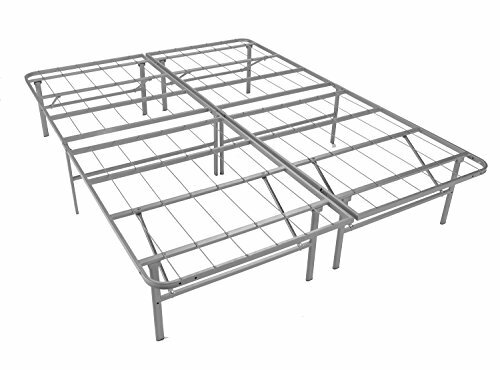 The Zinus Steel Elite SmartBase Frame is constructed from a sturdy steel frame with wire lattice to support your mattress. The frame is lightweight, so it can easily be moved from room to room, and it is easy to assemble with zero tools required to build the frame once it’s delivered. One of the biggest benefits of this frame is the 13 inches of clearance under the bed, providing more than enough space to store boxes, bins, and other storage containers. This is particularly ideal if you are short on space in your bedroom. This platform bed can hold up to 500 pounds and has a wire lattice support frame, designed to support all memory foam, latex, spring, and hybrid mattresses, so you can rest assured that your mattress is on the ideal surface for a comfortable sleep with no box spring required. Anyone looking for a simple, minimalist bed frame will love the Zinus SmartBase, as it has no foot or headboard, simply acting as a platform for your bed with no additional decor. However, you can attach a headboard to the frame if you choose to at a later point. Overall, we’ve picked the Zinus Steel Elite SmartBase Frame for this list because it’s a highly rated product for its sturdy, minimalist design, easy assembly, and high clearance space to maximise storage in your bedroom. Weight capacity: Some platform beds have a considerably lower weight capacity than others and this is definitely something you need to consider if you are a plus-size sleeper, a heavier couple, or if you have a heavy latex mattress that you are hoping to use with your platform bed. Slat spacing: If the slats on your platform bed are spaced too far apart, your memory foam or latex mattress could sink, potentially voiding your warranty and diminishing the comfort and support your mattress can provide. Experts recommend spacing no greater than 3 to 4 inches to avoid this problem. Profile: Platform beds can either have a high or low profile and this can affect how much space your bed takes up, as well as how much storage space you have underneath. If you are looking at platform beds specifically for the extra storage space under the bed, pay attention to the height of the bed to make sure it suits your needs. 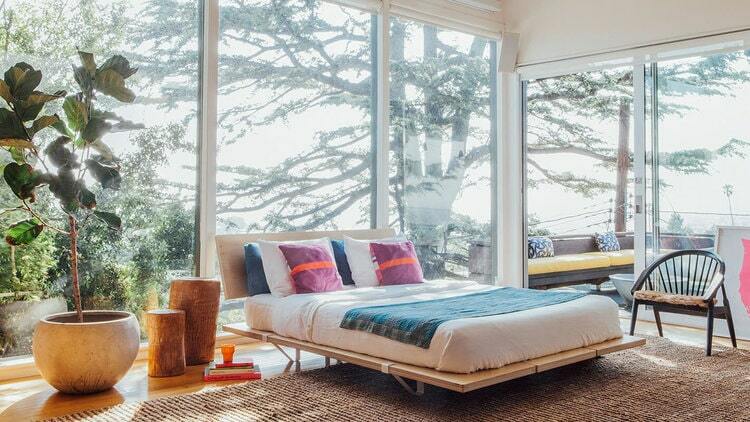 Aesthetics: Finally, a platform bed can be a great addition to your bedroom’s interior design. From minimalist, simple designs to contemporary beds that make a statement, think about what design will work in your bedroom with your existing decor when choosing a platform bed. As you can see, there is a huge range of options when it comes to selecting your platform bed. One of the most important things to do before buying your platform bed is to consider what type of mattress you will be using with it, in order to make sure both items are compatible. We hope this has given you some insight into the different types of platform beds out there and helped your decision-making process when choosing the bed right for you.